Dr. Kin is a graduate of Oklahoma State University College of Veterinary Medicine. She completed a surgical and medical internship at the prestigious Rood and Riddle Equine Hospital in Lexington, KY from 2003 to 2004. Dr. Kin then completed an Equine Practitioners Residency from 2004 to 2006. In 2006 Dr. Kin founded Exclusively Equine Veterinary Services. 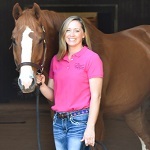 Dr. Kin grew up in Broken Arrow, OK where she competed in Dressage, Show Jumping, and Eventing. She was very active in the United States Pony Club, competing in and winning numerous national championships and serving as a national visiting instructor. She graduated from the USPC as an “HA”, the highest ranking in horse management. Dr. Kin actively competed in Dressage competitions at a national level through Prix St. Georges and won numerous national championships. She is a United States Dressage Federation Bronze and Silver Medalist and a graduate the “L” Judges Program with distinction. Dr. Kin was a member of the Oklahoma State University Hunt Seat Equestrian Team. She is a member of the AAEP, OVMA, and AVMA. In her spare time Dr. Kin enjoys spending time with her husband Chad and four kids-Michelle, Sarai, Carsten and Dax. Their children are very active playing numerous sports leaving Dr. Kin and Chad to coach and play chauffeur for their multiple tournaments. Dr. Kin enjoys all aspects of equine practice with her major focus being preventative and performance horse medicine with an emphasis on client education. Her outstanding credentials, over 15 years of experience and a lifetime of equine experience make her a well versed ambulatory veterinarian.